I'm fairly certain that everyone is at least familiar with the movie The Birds. Alfred Hitchcock based his film on Daphne DuMaurier's short story of the same name. There is no Tippi Hendren character in the story, however. Nat lives on an island in England with his family and works on a nearby farm. He's noticed some strange behaviour in the island's birds. Many of them haven't migrated and the unusually harsh weather is making them restless. One night his children are attacked in their beds by some birds. The incident alarms him but the locals brush it off. Things change quickly when the bird attacks intensify and people are trapped in their homes, helpless against this vicious force of nature. Even though I like birds, this story really creeped me out. The birds were organized; it was all out war. The story reminded me of those Zombie Apocalypse movies or more recently The Happening. I could feel Nat's fear and helplessness in the face of this natural disaster. How can he keep his family safe? There are just too many birds and they are out to kill. How will he keep the birds out? How will he keep his family fed? Although the story just sort of ends, I think it's even better than the movie. I'm not going to be able to look at those flocks of starlings the same way again. They must be up to no good. I watched the movie when I was in third grade, much too young. Since that time, I am terrified of birds of course. And yet still I love the movie and I love Hitchcock. I just read Rebecca and am looking forward to more du Maurier, so this might be my next read. Thanks for the review! I just recently found out through another book blogger that The Birds was based on a short story by Du Maurier. Since I read and loved Rebecca, I might have to track this one down. I read this last year and I agree, it's better than the movie. And since I'm scared of birds to begin with (for pretty much the same reasons as Trisha), imagine how creepy I found it! Lately, whenever I look out the window at the house behind/below us, there are pigeons all lined up on the edge of the roof. There must be about 15 of them. It's funny, but also vaguely reminiscent of The Birds. So unfortunately, I've been reminded of that movie a little too often lately. And I can't believe that poor Tippi had the birds tied to her! I really need to read this story. 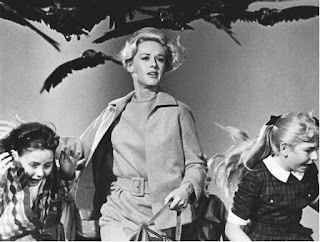 The Birds was one of my favorite movies when I was younger. Deslily- Wow, what a great story! I think I'd need a doctor after that too. Trisha- I love just about everything she writes. Lesley- Definitely look for it. Nymeth- I'm glad you think so too. Softdrink- I think the same thing whenever I see birds together like that. Lola- I hope you do!